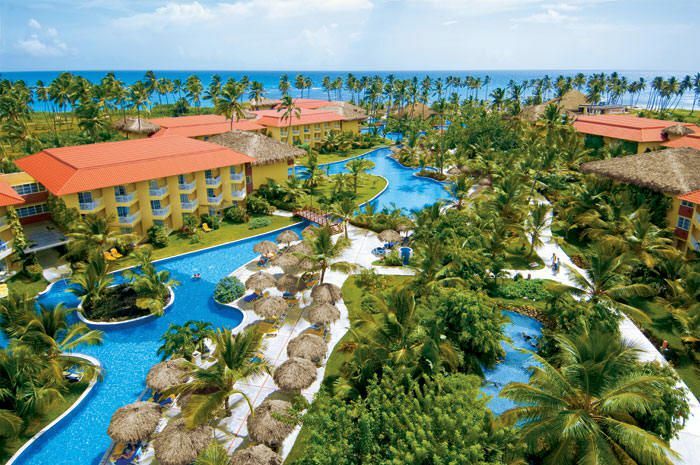 There are many all-inclusive resorts in the Dominican Republic, many of which are located in Punta Cana, a prime beach area on the island's eastern tip with a handy if small, international airport. Founded in 2004, Dreams Resorts & Spas is a brand of over a dozen luxury all-inclusive resorts for couples and families. Known for their ideal beachfront settings, Dreams is part of AMResorts, which is owned by Apple Vacations. The resorts feature well-appointed rooms and suites, 24-hour room and concierge services, excellent food, a variety of globe-hopping restaurants, activities for adults and families, and children's programs. Like most all-inclusive resorts, Dreams properties offer water sports, beautiful pools, and multiple restaurants. At the family-friendly property in the Dominican Republic, features include a large free-form swimming pool that stretches from the lobby to the beach, supervised kids and teen clubs, and myriad activities ranging from basketball and yoga to tennis and an ocean trampoline. The resort has a very long meandering pool, called the Lazy River Pool (though it's not a true lazy river with a current that carries swimmers along on floats). The long, river-style pool at Dreams Punta Cana is one of the largest in the Dominican Republic and features waterfalls, bridges, and swim-up bars. Another pool is located at the kids' Explorers Club, which offers activities for kids age 3 to 12, and on-site fun such as a pirate ship, castle, theater, snack area, and waterslide. Scheduled activities include arts and crafts, treasure hunts, an indoor game room, big-screen movies on the beach, hiking, sandcastle contests, and more. For kids under age 3, babysitting can be scheduled through the concierge. There is also a Core Zone teen center for older kids between the ages of 13 and 17. To find out what scheduled activities are available, check out the activities program. Located in the sports area, the Core Zone features nightly entertainment, daily activities and an array of sports and games. There are also weekly bonfires and dances. The resort offers spacious guest rooms that are larger than what you normally find at a resort. The smallest room (for two adults and one child) is nearly 300 square feet and sizes quickly ramp up to over 580 square feet for a family suite with two connecting deluxe tropical view rooms, one with a king-size bed and the other with two double beds. At Dreams Punta Cana, guests can choose from six a la carte restaurants, a buffet, and a café. Guests can also opt for room service, which is available at any hour day or night. Gluten-free dining options are also available. Be sure to check out the resort's special offers page. During slower seasons, we have spotted "kids stay free" deals, where up to two kids stay, play and eat free at Dreams Punta Cana Resort & Spa.